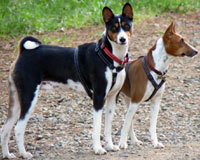 Basenji Dogs - The Basenji is a breed of hunting dog that originates in central Africa. It is considered by some, particularly in North America, to be a member of the sighthound family; most kennel clubs, including the American Kennel Club and the Kennel Club of the United Kingdom classify it as a hound. The Basenji produces an unusual yodel-like sound, due to its unusually shaped larynx. Although Basenjis do not bark per se, they can mimic sounds, and thus are able to mimic barks if raised among barking dogs. In behavior and temperament they have some traits in common with cats. This information is licensed under the GNU Free Documentation License. It uses material from the Basenji article on Wikipedia.org. Basenji Breeders - Advertise your kennel puppies and dogs here.